Shipping lines are fighting a new environmental regulation that they said will not only lead to stringent control over their operations but will also pave the way for a carbon trading policy resembling the one that sparked controversy in the aviation sector. To curb greenhouse gas emissions produced by the maritime trade – expected to more than double by 2050 from 1 billion tonnes per year at present – the European Commission is seeking to legislate a draft rule it made in late June requiring mandatory provision of data from carriers on their vessels’ fuel type, fuel efficiency and payload (the total weight of fuel and cargo). Kamar Zaman, a veteran analyst at Drewry Shipping Consultants, said it is infeasible if not impossible to ask a carrier to weigh all its containers. “How will you weigh those boxes, which come in millions? What kind of disruption will it cause to daily operations, and who is going to pay for the cost?” Zaman said. There are many firms and government bodies that calculate vessel emissions with readily available data provided by ship manufacturers and carriers. But the European Union wants a closer look, in the hope of imposing operational guidelines for the trade and ultimately an emissions trading scheme like the one it imposed on the aviation sector, which requires airlines that produce more carbon dioxide to buy credits from those that produce less. 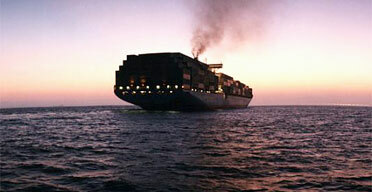 The shipping industry worldwide has been raising the alarm about the possible changes. Christopher Koch, president and chief executive of the Washington-based World Shipping Council, said it is quite impossible for carriers to comply with standards that regulate how much fuel they use, how fast they sail a ship and how they maintain it, which is like “teaching drivers how to drive”. There are many factors that govern fuel use and vessel speed, he said, including the weather, the need to meet schedules and outrunning pirates. Shipping lines have already been adapting to methods such as slow steaming, forming alliances to share resources and using new, fuel-efficient vessels to save fuel and cut costs in the wake of the downturn in the industry last year. The Hong Kong Shipowners Association said there is a limit to how much fuel you can save. “You might be able to drive your car more efficiently,” said Arthur Bowring, the group’s managing director. Until now, shipping has been the only form of transport excluded from the EU’s strategy to cut emissions, but Zaman said that was only because it would be very difficult to identify the party that should bear the extra costs. “Unlike aviation, where the airline is clearly responsible, there could be up to 20 consignees for one vessel,” Zaman said, referring to the fact that a shipowner may charter the vessel to a carrier, which then commissions a third party to operate the ship, the space in which is usually shared by several carriers. The EU draft is expected to enter into force in July 2015, although the first reporting period for carriers would begin in January 2018. Ocean-going vessels, burning bunker fuels with 2.75-4% sulphur content, is a major contributor of air pollutants to Hong Kong. Prevailing winds bring sulphur particles into the ‘urban canyons’ of Hong Kong, where the concentration of particles are increased, posing a huge health hazard to Hong Kong residents. Shipping lines are now complaining that the requirements imposed by the Hong Kong government to use cleaner fuels will increase their cost of business, and demands that the government extends a subsidy scheme that incentivises the use of cleaner fuels (the scheme does not end until Sep 2015). Alarmist warnings about ‘competitiveness’ with Shenzhen are being sent out, aiming to panick and pressurize the authorities to provide more incentives for doing what is right, even though they can share the extra costs with their clients as per usual business practices. Of note is that Hong Kong is ‘the only Asian city to impose such a requirement’. Hong Kong should not step backwards from the rare occasion of being the lead in an environmentally-friendly policy, with developing economies increasingly adopting environmental technologies and policies ahead of Hong Kong. Ships calling at Hong Kong will face higher costs when legislation requiring vessels to switch to cleaner marine fuel upon berthing is passed next year. Some carriers may, as a result, switch to neighbouring ports in Shenzhen. To prevent this, shipowners said, the government should consider extending a scheme that subsidises shipping lines – many of which are expected to suffer losses this year – for the extra cost of the clean fuel. However, a government official said, an extension is unlikely.